Karl August Georg Maximilian Graf von Platen-Hallermünde was born today, 24 October, in 1796. He was a German poet and dramatist. In German, he mostly is referred to as Graf (Count) Platen. Platen attended the university of Erlangen, where he sat at the feet of Schelling, and became one of his most enthusiastic admirers. As a result of his Asian studies, Platen published a little volume of poems in 1821 — Ghaselen, each consisting of 10 to 20 verses. These attracted the attention of eminent men of letters, among them Goethe. Offended by Heinrich Heine’s mockery of Asian themes in his poetry, Platen retaliated with his work Reisebilder, zweiter Teil, in which he expressed anti-Semitic sentiment directed at Heine. 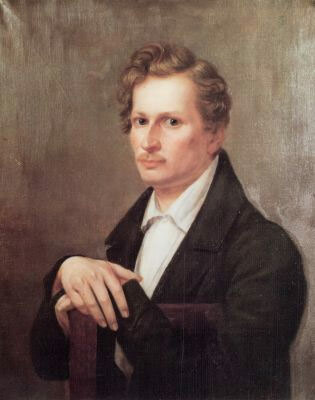 Heine reacted in turn by outing Platen, writing about his homosexuality in Reisebilder dritter Teil. This back and forth of mockery and ad hominem attacks is referred to as "die von Platen Affaire." Platen died in Italy on December 5, 1835, after contracting cholera.